Do you want to have a coffee? Easy. Just walk into the next cafe you find and order one. Do you need a new haircut? This one it's a bit harder, you may have to call and arrange an appointment with your hairdresser before you can visit. Do you want your nutritional therapist to advice you with your diet? Well, now things get more complicated. All of these steps have two purposes: to maximise consultation time together between nutritionist and patient, and to allow for a study of the individual's profile so that advice provided can be more relevant. Specially important are questionnaires, containing critical pieces of information needed for a successful consultation. Yet, in this process, there is an obvious disadvantage for the nutritionist perspective... Managing health questionnaires can be a huge time sink. Wouldn't it be amazing if you could have all your clients data sent to you in an structured manner, seamlessly integrated with your client database? Well, this post will suggest a few options to achieve just that. The first thing to do if you want to optimize your client booking process has to be to allow clients to do the paperwork for you. If you enable a system so that your patients can complete all required data fields before a consultation, then you won't have to do this yourself during a visit. A win-win situation for both you and your patient. How do you go about sending questionnaires? Here are a few suggestions. This is the cheapest, easiest way to automate questionnaires. However, it's also full of disadvantages. Firstly, some clients will not have the required computer programs installed in their computer or phone to edit your document (Microsoft Office, Adobe Acrobat, etc). Secondly, the format of the data may be altered when exporting/converting data files between different operative systems or platforms. Thirdly, you will have to manually integrate data provided by clients into your client database if you want to keep it all organised for follow up consultations... defeating the purpose of saving time. Who is this option for: I only recommend this option if you have a low volume of clients. You will not spend money in the short-term, but saving pennies here may result in losing bucks when clients cannot complete your questionnaire, or you have to spend the weekend organising your data files. Consider your options carefully and only opt for the one if alternatives are not suitable. There are some excellent free tools for creating beautiful questionnaires that can get the job done. Google Forms will probably be one of the most widely-used by nutritionists. The advantages of questionnaire tools are that you can use many of them for free, you can email questionnaires with a click, and your clients can complete que forms online in any device. These factors can allow you to save a lot of time and improve your service to patients. The main disadvantage is that tools such as Google are not designed for nutritionists, but for a broad audience of generic users. 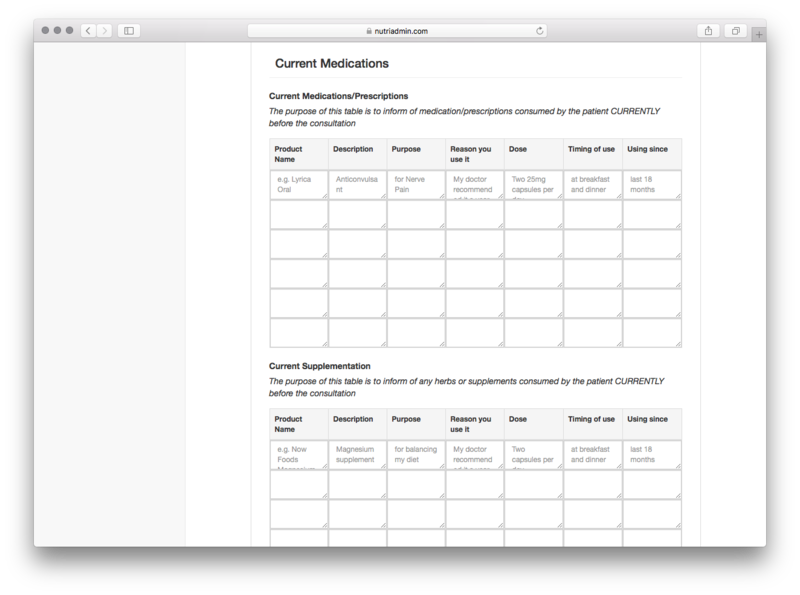 This means that you will have to spend hours configuring your questionnaires, you may not be able to implement all the questions you need (such as a table for supplementation, or medication), and you will still have to manually synchronise data provided by clients within your own database. Who is Google Forms for: This is a much better option than emailing documents in many cases, but still not the best. It's easy to end up with messy files, lost client data, or inaccuracies if the software is not optimised to serve the needs of nutritionists. The good news is that it's free. Our nutritionist software NutriAdmin, has been designed from its inception with the sole purpose of addressing the needs of nutritionists when managing their business and data. Since the software is specialised, you will probably find it one of the most convenient options for managing your questionnaires. With NutriAdmin, you can store different kinds of questionnaires (Initial visit, follow up, women specifics, etc), send them with one click, enable clients to receive auto-generated reminders before their visit if they forget to fill in your forms, and setup all your nutrition-related questions within minutes with the pre-built templates. NutriAdmin can do many other things apart from questionnaires, such as storing and organising your client data, managing reports, meal plans, appointments, and more. The main disadvantage of a specialised tool for nutrition professionals such as NutriAdmin is that it's not free. This means that you will have to weight the relevant advantages of time saved and hassle avoided, with the investment of a fee. Who is NutriAdmin for: NutriAdmin will be useful to you if you have a steady flow of clients, if they routinely request follow up consultations spanning months since their initial visit (so that you have to track their data and keep it organised) and if you want to really optimise and automate your nutrition questionnaires. That said, if you are still starting up your business and have very few clients, you are probably better off managing your questionnaires with one of the free methods mentioned above. Automating your nutrition questionnaires and letting your clients fill in their own data for you it's possible, and will be advisable in most cases. This article outlines three different options, each with their advantages and disadvantages. There is obviously a fourth option: To do everything manually on paper during visits, however most nutritionists will agree that this method can easily become a nightmare once you spend more time with paperworks than with clients. I hope this short analysis helps you see your options with a new perspective and feel free to comment sharing your thoughts. Diego is the cofounder of NutriAdmin, a specialised software solution for nutritionists. Diego holds an Mphil in Scientific Computing from Cambridge University & has a background in finance in London.